A: CKD Stage V requiring dialysis, AV fistula patent. This is what you need to know, you break this down really quickly. These are things that you need to have memorized and I’m really good about telling you. You just need to be aware of this or this is what you need to have memorized. If you’re at this point where you’re taking a CRC pre-employment exam, then you need to have this stuff memorized. You need to know CKD as chronic kidney disease; that there is more than one stage of CKD, 1 – 5. Dialysis is treatment for CKD, AV is arteriovenous, a fistula is access point. When you see AV fistula that means that they have been set up to get dialysis, it’s literally where they plug you in. To get your dialysis patent, it just means, that’s how they’re saying that everything is fine with the fistula in the arm and that it’s stable. It’s open and unobstructed is the definition, but again it looks good. You have to know that, memorized, and again you probably do. Let’s break down some differences between stage 4 CKD and stage 5 CKD. You don’t need to know the numbers and the lab work and stuff that differentiates between 4 and 5, you just need to know that there is lab work and numbers that will take you from stage 4 CKD to stage 5. You’re not a clinician, you’re not a provider, you don’t have to have that memorized, you just need to know the difference. CKD 4 is you really got a problem with the reduced kidney function, it’s classified as severely reduced. Then, CKD 5 is very severely reduced. Like, “OK, that’s so similar,” but stage 5 is a little different because you’re going to see end stage or ESRF or ESRD (end stage renal disease). That is going to pop up and be a part of stage 5; we’re moving into end stage renal disease if we’re not already there. So, be aware of that. 1-4 that’s compromised kidney function. By the time you get to 5, you’re looking at ESRD. Also, the reason you need to know this, is because you need to understand the disease process. With risk adjustment, you’re looking at a year’s worth of documentation, so if you’re working with a person that starts the year out with CKD4 then their lab works, they’re changing their diagnosis with 5, and then you can probably expect, “Hey, we’ve got end stage renal disease in the future, possibly this year.” So, you’re constantly thinking the disease process. [note] with that. This is where they can get you. You need to be aware that when you’re dealing with CKD5 that if the CKD5 requires dialysis, it jumps and now it’s N18.6. The codes change. If you’re not aware of that, then you’re going to put down the wrong code and then you’re probably going to have the wrong HCC, etc., etc. If you are coding then N18.6, which is end-stage renal disease, because our CKD 5 patient is on dialysis, then you also need to be aware of the Z code, Z99.2 for a status code for dialysis. Very important. So, we’re looking at what codes now? Again, Z99.2, dialysis, there’s a whole list of status codes that you’re going to be very familiar with when you’re doing risk adjustment course. In fact, we just talked about this on our Wednesday night Student Support Call on all of these status codes that are commonly overlooked, that risk adjusts. Z99.2 is one. So, you always want to be familiar with any type of Excludes that go with that. I threw this in as well because if your patient is not just CKD – this particular one isn’t – that they may have hypertensive chronic kidney disease. That changes the coding because there’s a causal relationship between hypertension and CKD. This one isn’t applicable for the scenario but be aware of that. That’s one of those things you need to have memorized. I12.0 would be hypertensive CKD stage 5 and then again you would be doing the N18.5 or N18.6; if they were stage 5 chronic kidney disease, hypertensive, and they were getting dialysis, it would be N18.6 because we were just told that a CKD 5 on dialysis makes them an N18.6, the ESRD. The rationale that we give you with this particular scenario is how you look up the codes because you’re looking them up, from scratch I like to say, so you’re going to the Index. Unlike when you’re testing, you’re not really going to the Index, you’re focusing on the Tabular that give you the choices. Pre-employment exams, real world coding, you live by the Index and you always reference the Tabular. You’re going to look under Disease, Kidney, Chronic, Stage 5; but the Tabular list includes the Excludes 1. Now, under the N18.5 saying that you have to go to the N18.6 if they are on dialysis, and then the additional code is mentioned in there. The way it’s defined, the Z99.2, dependence on renal dialysis; so you look back at that and you say, “Well, do I need to code for the fistula?” because that’s the thing. You don’t have to code for a fistula because they’re on dialysis. When you look at the description, it tells you Z99.2 dependence on renal dialysis, but the fistula is surgically created for dialysis. That’s all put in there with that Z99.2, so don’t be adding another code regarding the patient having a fistula. Just wrapping up, I wanted to show you what those AV fistulas look like and where they’re at in the arm, because if you have a patient, the documentation was AV fistula, it’s going to be mentioned mostly likely more than once. But definitely when he does a review of the body systems and stuff, it will be mentioned, and that’s a heads-up, “Hey! He’s probably on dialysis,” we get to put that Z99.2. Chandra, did you want to add something on there because I went through that pretty fast. Chandra: People are really excited that you cover this in the chat, Alicia. People that are studying for their CPC and their COC are going, “Hey, this makes this come together for me, from a diagnosis’ standpoint not just for risk adjustment, which is great.” I will point out all of the answers that we went through here is an ICD-10. For the pre-employment exam that we developed, we give you an answer key for both I9 and for I10 so depending on which employers you’re looking at. Somebody else asked, “What are most employers using?” Many employers are testing you on both right now. Just because they’re wrapping up I9 and starting I10, and last year was a mix, so they’re actually testing on both. But what I wanted to go back to here was two things: One, somebody asked, if you’re using N18.6, the end stage renal disease, and we know by definition that they have to be on dialysis to use that code. Why do I need the Z99.2? That’s a great question, most people would say because the Tabular tells you, you have to under N18.6. It says you need that code so you better put it on there. Alicia: Actually, use additional code. Chandra: If you scroll up Alicia to where you have the Z99.2 and it lists those excludes notes, this is where I’m going to explain why we have to have that code. We use the N18.6 to say that the patient has end stage renal disease, or they have stage 5 kidney disease requiring dialysis. It means if they don’t have dialysis, things are going to go from bad to worse pretty quickly. I’m just reminding you this code comes into use with the N18.6; so you have N18.6 to say they have the end stage renal disease. Then you have the Z99.2 to say they’re dependent on renal dialysis. If you noticed under the Excludes 1 note there’s actually two exceptions where this code would not be the appropriate one to use with N18.6. It was funny because somebody asked this question really early in the chat before we ever got to this question today, so I was excited about this. If the patient is coming in for that fitting and adjustment of their catheter, yeah they may be dependent on renal dialysis, but that’s not why you’re seeing them today. That’s not related to the N18.6. Instead, today, yeah they still haven’t have end stage renal disease, we need that in N18.6, but instead we want to code first, the whole reason they’re here is for us to pay attention to that dialysis catheter. We got to change something with it, we’ve got to fit it, we’ve got to adjust it, we’ve got to move something, something is not working right. That’s where we would use this [that is, Z49.0-] in front of the N18.6 and the Z99.2 wouldn’t be on there at all because they’re not just dependent on it, they’re not just coming in for dialysis, we had to do something. 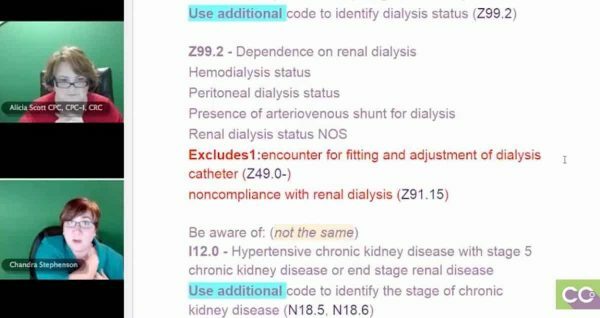 The noncompliance code, the Z91.15 is another code that we could use in combination with N18.6, because in N18.6 says they have end stage renal disease or stage 5 kidney disease requiring dialysis. But if they’re not doing the dialysis, we wouldn’t want to use Z99.2, they’re not complying with what they need and instead we would use the Z91.15 to say, “Oh, they need it but they’re not having it done,” and that flags a number of things with the insurance carrier. Is there anything I left out? Alicia: No. But that is an interesting thing to just know as far as the disease process, too. One thing is that in our student call last night we had a scenario with the HIV patient who was an N18.4 or 5, I can’t remember, but he had AV fistula but he hadn’t started dialysis yet so you don’t get tripped up just because they have a fistula and it stated twice in the documentation that he had not started dialysis and that they were wanting him to. So, you can’t use Z99.2, he had not started it. On the disease process side, noncompliance was renal dialysis. I’ve had patients as well as encounters where the people have decided to stop dialysis for various reasons, it’s not an easy thing to do. Usually, when they’ve been on dialysis and they choose to stop dialysis we’re talking 5 to 7 days left for them, but it’s pertinent that that would be considered noncompliance with renal dialysis. They’re not status Z99.2 anymore, they’re now a Z91.15. Like Chandra said, that changes the payer perspective, that changes a lot of scenarios, so you want to be very careful to pick up on the documentation. This overall, as explaining this and these little nuances, that really is what makes the person who is a coder, I think really go into that next advanced level to where they’re starting to specialize in something. You need to be aware of these little nuances, that’s what makes you a great coder. 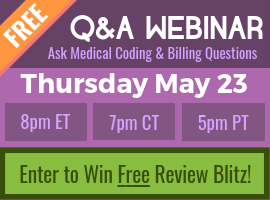 Chandra: The only other thing I want to say is somebody in the chat asked, “I understand all of that, but Z49.01 “which is one of the encounter for fitting and adjustment of the catheter, it’s specifically for extracorporeal dialysis “why would they not code that with the dependence on renal dialysis?” The answer to that is because that Z49.01 by definition, you’re not going to have a dialysis catheter if you’re not on dialysis. It’s not the same thing as AV fistula. This is, we’re cleaning the actual catheter that they have, so there’s no need. The Z99.2 in that case would be redundant. It’s kind of included or bundled into that encounter for fitting and adjustment. Alicia: That gets confusing especially when you’re new to coding. It’s like, some stuff, seems redundant, why are you making me code it? Then, other times it’s how do I know it’s bundled in? Part of that ends up because you understand the disease process, understand why they would do that. Why do they need those two codes to explain it versus with this one code it explains everything. So, that comes with practice and understanding the disease process. Just keep in mind too there’s more than one type of dialysis, and so as you go and do your studying about dialysis, if you’re not familiar with how it’s done, one is they go through the arm, another is they do it into the abdomen. Little heads up, do some investigating and increase your knowledge based on that. Excellent! This article is definitely leading me to do some investigating of my own. Highly appreciate this discussion. Such a very big help for employment preparations and anxiety levels for getting a job as a CRC. Thank you! This is great. Found the breakdown between the 2 types of dialysis interesting. Off to study a bit more about CKD. In transitioning from facility Inpatient coding toward Risk adjustment, I am finding CCO a very valuable resource! Thank you! Well explained! I’ve done some research on RA/HCC and it seems very interesting! I recently applied for an HCC position and I am required to take a pre-employment assessment and I was wondering what type of questions should I expect. Thanks for the article!